Saraki, Ortom, Kwankwaso, others attend PDP NEC meeting National Executive Committee, NEC, of Peoples Democratic Party, PDP, yesterday, appointed Senate President, Dr Bukola Saraki, as its National Leader. The appointment came on a day Governor Aminu Tambuwal of Sokoto State said any attempt to remove Saraki as Senate president would be stoutly resisted. Being the highest office holder in the party at the moment, Saraki will replace his deputy, Senator Ike Ekweremadu, who held the position until his defection with other top APC members to the PDP. Saraki, Rabiu Kwankwaso, Governor Aminu Tambuwal of Sokoto State and Governor Samuel Ortom of Benue State were all present at the meeting. The NEC meeting was in celebration mood as the politicians exchanged banters. 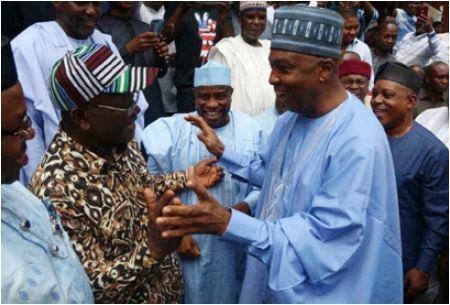 Apart from former APC chiefs, the meeting hosted key figures in the PDP, including governors, lawmakers and some of the presidential aspirants. On his part, Saraki described his first day at the party’s national headquarters since his defection as “a great day for our country.” While stressing that a day for long speeches would come, the Senate President expressed gladness to be back to the party where his journey to political limelight began in 1999.